Mountain Buggy Nano is the ultimate travel companion that promises convenience, longevity, an authentic Mountain Buggy experience of ease and maneuverability with first class safety innovation. A stylish and innovative travel stroller, Nano is a game changer for the world of nursery travel, and is going to strongly influence the direction of what a travel stroller should deliver. With its premium quality, refined style and strength of heritage, Nano is a much welcomed addition to the Mountain Buggy range, offered to the customer as first class travel in a bag. Weighing at just 13 pounds and with the ability to compact fold into its included travel bag, it fits into overhead luggage compartments for families who value ease and pure functionality. 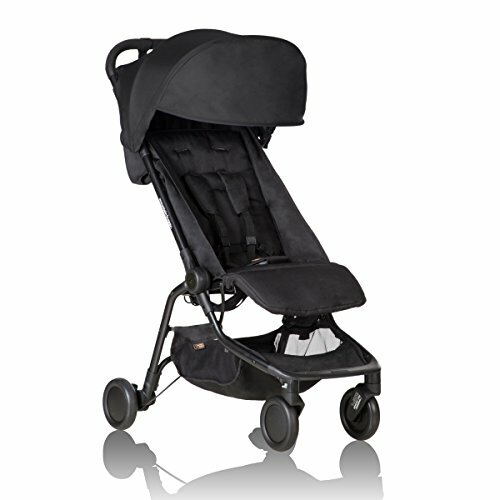 The sophistication of Nano is that it also provides dual functionality to take your infant car seat with its built in car seat adapter (no need to purchase extra accessories), and then perform as a super compact, urban stroller for years to come - a desired item for today's busy, travelling modern families. Nano now has the ability to be used for a newborn to stretch out lie flat with a soft shell cocoon carrycot (sold separately). With key relevant features, nano boasts a super quick unfold plus an easy fold down system that locks it down to a travel bag size. Additional features include a full size seat, a larger sun canopy with flick out solid sun visor, a handy shoulder strap for hands free transportation, and a well ventilated seat back when in recline. New features for 2016 include: 30% deeper recline, 1"narrower width, greater sunhood coverage, solid flip-out visor, ultra slimline wheels and sun mesh extension with a fabric overlay (for winter coverage) when seat is reclined. We listen, develop, and deliver based on feedback from consumers and it can be seen in all the great features on the new 2016 Nano stroller.